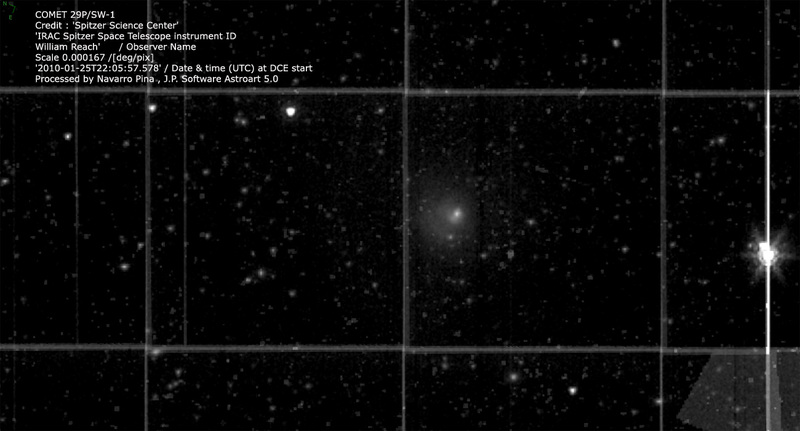 COMET 29P/ SW-1 image of arc emission outburst dust , processed by J.P.Navarro Pina . 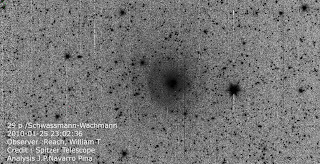 Credit image : SPITZER TELESCOPE Smog Check for Comets: Measuring cometary CO2, CO, and particulate emissions Category: solarSystem: cometsPI: Reach, William T We propose to measure the CO2, CO, and dust emission from a sample of comets. This study is in the spirit of the A'Hearn et al. 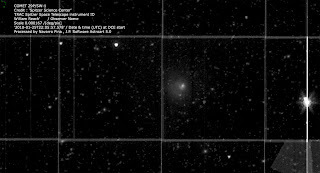 compilation of the OH, C2, and dust production rates for 85 comets, wherein the only widely accepted, physically-based taxonomic types of comets were identified. 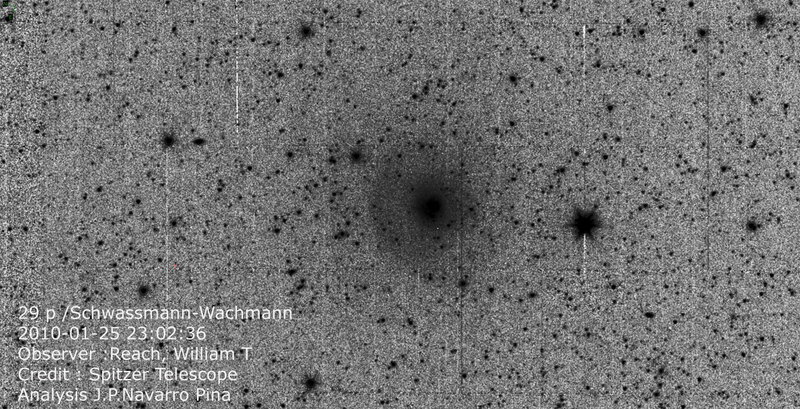 Specifically, C-chain-poor comets, which are predominantly dynamically short-period comets that formed in the Kuiper Belt, are distinct from the C-chain-rich comets that tend to be long-period comets arriving from the Oort cloud and having formed formed in the Jupiter-Saturn region. 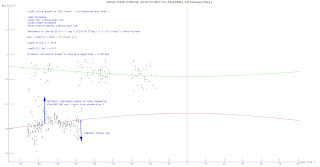 Spitzer/IRAC observations are unique in their sensitivity to CO2 and CO gas. CO and CO2 have prominent spectral bands that fall within IRAC channel 2, while dust strongly dominates IRAC channel 1. Despite being the second and third most abundant compositions of cometary ice, their high abundance in the Earth's atmosphere makes ground-based observations exceptionally difficult. 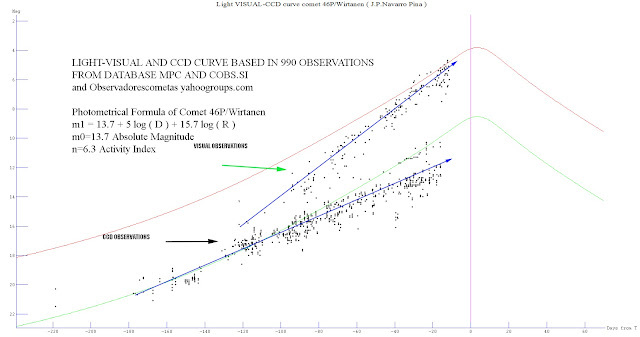 Based on my analysis of the reduced light curve of comet 46p, based on 990 measurements, being the world's largest light curve, the preliminary scientific results are: Estimated diameter 0.96 kms, Estimated active surface area ~ 50km2, Water production rate Q (H2O) ~ 10 ^ 29.5 mol sec = 5 tons per second of water, it is observed that ar = 1.25 au, there is a change in the predominant chemical volatility being Q H2O> Q CO +, these results are preliminary, until completing the light curve, and are based on the following scientific references: Sosa, Fdez (2011), Yang (2008), Navarro (2018), MPC / IAU, Cobs.si, Observerscometas yahoogroups.com (Navarro owner).